Celebrating life’s unforgettable experiences. History, grandeur, interpretation. Your artistic expression reigns supreme. Celebrate 30 North gives you ultimate freedom in planning your fantasy reception, business luncheon, or casual brunch. 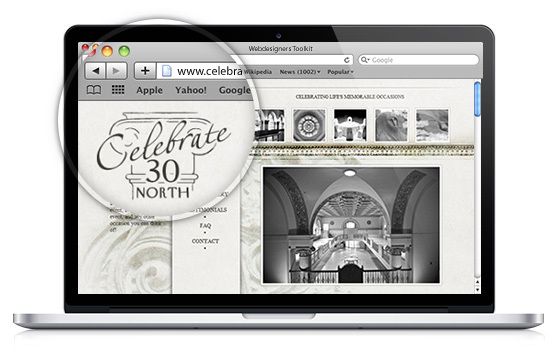 Create a simple website that elegantly shows the beauty of the historic 30 North building and its uses. OMA Comp visited 30 North to take pictures of the restored building and a wedding reception taking place there. We designed a website that truly shows the elegance and freedom of expression. Come celebrate with us.